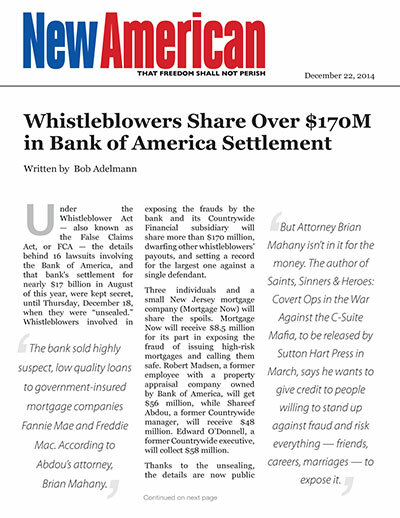 Under the Whistleblower Act — also known as the False Claims Act, or FCA — the details behind 16 lawsuits involving the Bank of America, and that bank's settlement for nearly $17 billion in August of this year, were kept secret, until Thursday, December 18, when they were “unsealed.” Whistleblowers involved in exposing the frauds by the bank and its Countrywide Financial subsidiary will share more than $170 million, dwarfing other whistleblowers’ payouts, and setting a record for the largest one against a single defendant. Three individuals and a small New Jersey mortgage company (Mortgage Now) will share the spoils. Mortgage Now will receive $8.5 million for its part in exposing the fraud of issuing high-risk mortgages and calling them safe. Robert Madsen, a former employee with a property appraisal company owned by Bank of America, will get $56 million, while Shareef Abdou, a former Countrywide manager, will receive $48 million. Edward O’Donnell, a former Countrywide executive, will collect $58 million. Thanks to the unsealing, the details are now public behind the fraud that turned Countrywide from a trophy to an albatross for Bank of America. O’Donnell originally filed suit against the bank in 2012, charging that Countrywide’s “Hustle” program allowed poor-quality credit risks to borrow money far beyond their ability to repay. Mortgage Now accused the bank of misrepresenting those loans, which it submitted to the Federal Housing Administration for reimbursement. Madsen was the initiator who gathered momentum and assistance from a “whistleblower attorney," Brian Mahany, whose law practice consists of finding whistleblowers and then helping build their cases and convincing the Justice Department to take them on. Madsen had worked for LandSafe Appraisal, which came over to Bank of America when it bought Countrywide. When he learned that appraisals were being inflated to justify loans to poor credit risks, allowing larger loans (and higher fees) to be made, his superiors tried to force him out by, among other things, cutting his hours. Instead of leaving, he got mad, found Mahany, and the rest is history. The IRS considers such payouts as taxable as ordinary income, so each whistleblower is likely to take a significant haircut (up to as much as 40 percent); but they will still be left well off financially. As will Brian Mahany, who describes himself as a “former New Orleans street cop turned high profile lawyer” who now, according to his website, “deliver[s] justice by financial recovery in difficult, high-stakes situations.” Assuming that Mahany works on a contingency basis, his small firm in Wisconsin will likely take another third. They risk their jobs, friends and careers to do what is right with no guarantee that they will receive a penny. Our job as whistleblower attorneys is to package these cases, provide key information to get the government’s investigation started, make the case understandable and explain why it is worthwhile [for them] to pursue it. As word gets out about these enormous whistleblower payouts, Mahany’s small practice in Milwaukee is about to mushroom.